These days, shooting a Barrett or an AR-50 in .50 BMG practically costs an arm, a leg, and a first born. Thanks to PMC, however, you won't have to give up any bodily extremities or offspring to keep your fifty-cal blasting away. 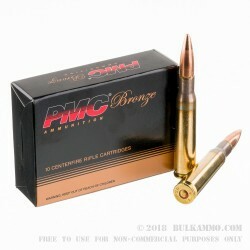 Packaged in 10-round boxes, this PMC Bronze ammo is affordable yet made with great precision to maintain the accuracy that long-range shooters demand. 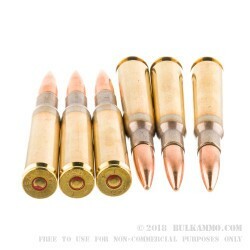 The Boxer-primed brass cases are fully reloadable, a major advantage for .50 BMG. 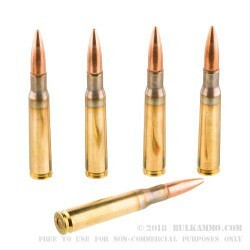 Each 660-grain boat-tailed full metal jacket bullet boasts a muzzle velocity of 3080 feet per second and produces an impressive muzzle energy rating of 13,688 foot-pounds, which would be quite impressive (albeit messy) if you were to shoot anything point-blank with it. Which you probably shouldn't. PMC is the commercial brand of the Poongsan Corporation. As a major supplier for the South Korean military, Poongsan is well equipped to produce significant quantities of .50 BMG rounds while maintaining good quality control. The company also produces even bigger ammunition such as artillery shells as well as a full line of range ammo under the PMC Bronze brand and self defense ammo such as Starfires under the PMC Gold Starfire brand.